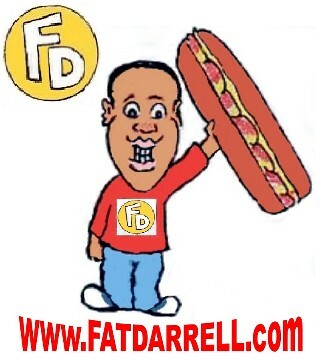 The Quest for Pizza – #DoubleFML FatDarrellPalooza! That’s right everybody, follow your dreams! …or should I say, “follow your memes”? Actually, don’t do that, most memes will get you slapped or arrested. But thanks for the inspiration Tee Brown! Hey, a man’s got needs, ya know? And right now, those needs are stuffed with refried beans and guacamole. Ole! That’s honestly how most of these fusion recipes get started though…including my namesake ®Fat Darrell Sandwich. Some greedy maniac attempts to satisfy all their cravings at once and voila! There you have it. I’d imagine pregnant women started many of these fusion restaurants! …especially this new one I read about serving pickle ice cream cones topped with Hot Cheetos! Here’s a local restaurant that caught my eye last month. Wings, Chinese food and pizza?! Whoa! I’d normally say, “sign me up” but the pizza on display looked like it came straight from the New Monmouth Elementary School cafeteria. Wow, this photo brings me back! Those slices were both good and bad at the same time. The key was to get one that hadn’t sat on the warmer too long otherwise it was dryer than my last manager’s personality! You’d end up drinking half your chocolate milk before the third bite. If you read the post where I discussed my term as student body president of Thorne Middle School though, I was able to swing a deal with Domino’s to provide an alternative to these nostalgic square slices! Anyway, the closest I’ve come to this pizza and Chinese food marriage was when I ordered pepperoni slices from Ninnette’s in Tinton Falls, NJ while they made my combination platter at Panda House next door! Wait a minute! I just did a quick search for Ninnette’s and it seems they’ve gone out of business? What? Is Panda House still there? How was I not made aware of this sooner? Jersey friends, you’re slacking! Lynda Lettice, I want answers, immediately! My other favorite Jersey pizza destination, Guido’s, better still be open or I may riot! In the meantime, RIP Ninnette’s. You’ll be missed. They also recently knocked down the old Steak and Ale I used to bring high school dates, so my childhood restaurant memories are crumbling! Just kidding! Her father had to help me push it to an open area in their driveway though! That was shortly after I inadvertently called her mom “hot” in an old photo on the coffee table! Whoops. Anyway, before we move on, here’s the mini-human who made me watch 5 back to back episodes of Little Einstein’s a few weeks ago. That’s my longtime friend Ameera and her youngest daughter Ava. She’s the one I was referring to last post. I’ve known Ameera since our grade school square pizza days! They were making the long drive from North Carolina to Mexico, so my apartment was one of their pit-stops. I’m glad they dropped by 2 weeks ago instead of last week since a plumbing issue had my apartment smelling like a sewer for several days! I still need to have my garbage disposal replaced but thankfully, the issue is mostly resolved now. It was pretty awful for a while there! I’ve never been the handiest guy in the world so I’m glad the maintenance crew figured it out! Until last week, I probably would have guessed that a ‘p-trap” was a funky blend of EDM and hip-hop. Anyway yeah, never stop learning my friends. Wait a minute, hold up. Let’s take a look at that photo I took with Ameera and Ava again, shall we? What in the “triple crown Belmont Stakes” is going on here? You know who else I kind of look like in this photo? Pac-Man. No, seriously, look! It makes sense though, as I’ve said before, Pac-man and I have a lot in common! Short, bald and always eating? Check. Haunted by ghosts of the past and constantly dodging haters hellbent on keeping me from getting to the next level? Check again. Pac-man’s not the first cartoon I’ve been compared to though. My friend Rich Brevard roasted me several years ago by saying I looked like Hefty Smurf after I made the mistake of wearing a light blue Under Armor top with white track pants to the gym! Never again…although I suppose he had a point! The resemblance is uncanny. I can’t remember why, but several years later, my friend Champ also said I looked like a Teenage Mutant Ninja Turtle at the gym we worked at. Hmm… Bald and animated with muscles, loves pizza and currently living in an apartment that smells like a sewer? Check again. I also recently interviewed WWE Superstar Sheamus who played Rock Steady in the live action Ninja Turtles movie so okay, maybe Champ had a point! I can’t deny that resemblance either. Darrelltello perhaps? Anyway, I always encourage you to comment with food items, restaurants and recipes I should try, and boy did that request pay off this week! That’s right folks, my buddy Jin Yoo came through with the great suggestion to look for the new frozen pizza options from Quest Nutrition! What? I had no idea these existed, but I’m absolutely down! If you’re a regular here, I’ve always been a fan of Quest. I’ve already recommended their protein shakes, bars, potato and tortilla chips in previous posts. They’re all tasty (especially for health food), so I have high hopes for their pizza too! Before you ask, no, I’m not on Quest’s payroll. Although I was offered a brand ambassador gig with them several years ago but couldn’t accept the position since I represented a rival company. I’m no longer with their rival though so hmm…where did I put that business card? Anyway, these pizzas are being sold at Target so away we go! Wait…this isn’t Walmart. I’d better shower first. Okay, NOW. Away we go! Oh yeah, check out what my friend Melinda Corse spotted at her local Walmart. Ha! $7 caviar? Who made this? Fancy Feast? I don’t know about that one. Any takers? Comment below! Anyway, despite the Target website saying they had 6 of each flavor in stock, none were on the shelves when I arrived! They’re literally “hot off the presses” so none of the local stores had received their shipment yet. Blah. And to think, I showered for this? The manager told me to check back the next day after their grocery shipment arrived so day 1 of “The Quest for Pizza” was a colossal failure. At least I got to take this picture with the store mascot before I left though, so I suppose it wasn’t a complete waste. The next morning also got off to a bad start since they still didn’t have the pizzas in stock when I called. However, the Super Target had them, so I threw on my Ninja Turtles hat (Sup Champ?) and raced over! Oh wow, and I felt fancy driving to regular Target! Shopping at Super Target must make me “super fancy” now! Anyway, all 3 flavors were in stock! The options were Thin Crust 4-Cheese, Thin Crust Supreme and Thin Crust Uncured Pepperoni. I was going to try all 3 but dropping $21 plus tax on 9” frozen pizzas felt like overkill. I could go to an actual restaurant with that kind of cash! Plus, it matches my hat! Want one? Visit BelovedShirts.com and use discount code DOUBLEFML to save 10%! I haven’t played many video games in recent years, but I was an old school Nintendo junkie back in the day, so this hat is perfect! Yeah, I know. Immature as always but in my defense, it was on display in the men’s department, not kids. I almost had to race some middle schooler to grab the last one though, but 2 were on the shelf so crises averted! What can I say? Adulting is hard…or boring at the very least. For example, even if I had kids already, at what point does a lame hat like this become desirable? #1 Dad? # Dork perhaps. Even without the words, look at it! They had a whole separate shelf of boring, oddly shaped hats like this on the other side of the men’s section. Call me childish all you want, but my Nintendo hat is much cooler than this travesty! Anyway, the first thing that jumps out about these pizzas are the nutrition stats. The serving size on the 4 cheese and pepperoni are half the amount and the supreme is a third. Since most people seeking a healthy pizza will probably eat the entire thing, be prepared to do the math to figure out what you’re actually consuming. The pros are that each serving is high in protein and gluten free! Sadly, Quest had the same issue most frozen food companies have in that the sodium numbers are through the roof! These are not for the faint of heart…literally! Unfortunately, frozen foods usually require extra preservatives to keep them fresh so it’s a tricky proposition. Quest does an incredible job keeping their stats in check on non-refrigerated items, but this challenge was more daunting. Let’s see how it tastes though, shall we? Well…after a 20-minute wait that is. Here’s what it looked like before going into the oven. I suppose this break gives me time to slip into something more formal for this momentous occasion. If you’re wondering, yes, those are little pizzas on the button up shirt as well. Anyway, it’s finally done so let’s taste this thing! The Verdict: Not bad Quest Nutrition. Not bad at all! It tastes like…well, it tastes like an every day frozen pizza. I mean that as a compliment though because anything marketed as “healthy” and “gluten free” could potentially taste like a cardboard brick. You won’t mistake this for delivery, but when compared to most regular frozen pizza options, it blends right in. The bar most healthy alternative options need to clear is to just not be disgusting. So in that regard, Quest has accomplished their mission. However, the health benefits are debatable which is the problem. That’s why Quest was wise to only list a third of the nutrition stats on the Supreme and half on the other flavors. It’s a personal pizza though so the odds of anyone cutting it into those serving sizes are slim to none! Especially after a grueling workout. As a result, that tiny pizza I just devoured contained 1420mg of sodium and 42 grams of fat including 18 grams of saturated fat! On the plus side, it was only 680 calories and contained 56 grams of protein but it’s hard to honestly say the pros outweigh the cons….especially for $6.99. Although I’m still a huge Quest fan overall, I always keep it real. This product is a miss. Instead, you’re better off making your own using healthier ingredients or just ordering regular pizza in moderation. You can also join our Facebook foodie group, Phenomnomnomenal, by clicking here! When creating a strength training routine, make sure to incorporate exercises that train your entire body. Even if you love training your arms and “want huge guns”, you should also show your legs, back, chest, shoulders and core some love too! Those “don’t skip leg day” memes are right! It’s not a good look and also leaves you more susceptible to injury due to muscular imbalances. Consider incorporating compound exercises that train multiple muscle groups at the same time or at the very least, be sure to address each one individually before the end of each week. Before we head out, as always, here are your “foodie holidays” that occur between now and next post! Hmm, okay a few of these are a bit redundant but hey, I love ice cream too so, I’m down! …but wasn’t National Hot Dog Day also on July 4th? I need to investigate who makes these lists and lobby to make ®Fat Darrell Day official in January! 7/17 is also World Emoji Day? Who knew?! It’s pretty obvious my favorite is the upside smiley face! I use the flexing arm and pizza one a lot too though. What are your favorites? Anyway, please make sure to leave a comment below before you go! You can also follow me on social media by clicking the logos on the side panel. Whatever you get into this week, I hope it’s incredible! Summer is winding down so make the most of it before it’s over! That advice was somewhat hypocritical since I haven’t done much yet myself, but each day is another opportunity to do something epic, so get out there and make things happen! Next Post Michael Baisden Live from The OC! Ahhhhh the lunch tray!! and the horrible fruit cocktail that follows!!! How I miss that nasty THANG~!! Best Meme for this post goes to…..”Cavs expected to sign Ice Cube after he messed around and got TRIPLE DOUBLE!” Had me banging my table laughing!!! If Doublefml is a place…..please take me there! Hey, it’s the man who inspired today’s topic! I’m glad you liked it and solid advice about the Chinese food. Great…now I’m hungry again lol. Ha I miss those awful school lunches too! ..or at least that time period. I totally forgot about the fruit cocktail until you mentioned that! Too funny lol. And yeah, The Cavs could probably use Ice Cube next season! They might need all the help they can get since LeBron left! Your Sixers are going to be nasty next season though! I don’t quite have a shirt for every food yet, but I’m getting there! lol I’d rather wear a burrito shirt than that awful #1 Dad hat again though! This post is hilarious!!!!! What…a pizza hat to match your pizza t-shirt? So cool!!! Thanks for info on “foodie holiday” My friend and I really had a guilt free ice cream day…. I never thought to compare you with Pac Man —Good analogy…short, bald, and always eating!!! LOL It must be nice to eat anything you like. Unlike many of us, you and Pac Man can eat a lot and still look good. I guess that is the power of being a fitness expert. By the way, thanks for sharing your free fitness tips. Thanks for compliment but nope, my goal isn’t to mislead you guys. I workout almost every day, stay active and eat well most of the time. I just make the most of those cheat meals, that’s all! I’m glad you’re finding the fitness tips useful. The goal is to launch a separate fitness blog soon so stay tuned! That quest pizza really looks good! Of course, any pizza is great looking to me. I am not sure about your old school lunch pizza. smile The story about your car dying at your friend’s house after a date really cracked me up! I was picturing you with her dad pushing the car into the driveway… I love that pizza shirt that you are sporting in this post. Hey Hope! The Quest pizza wasn’t bad, just a little high in sodium. I’m glad my date had a sense of humor with that car ordeal! Thankfully it happened just as we got back to her house!